CanTest Directors Prof Willie Hamilton and Dr Fiona Walter discuss the implications of the recently published NHS long term plan to the work of CanTest. The NHS long term plan was published in early 2019 and describes the Government’s views on how the NHS can evolve over the next 10 years. Thankfully it avoids some of the classic errors – particularly any further large-scale reorganisations – and focusses on several areas, with cancer notably being the first it namechecks. What does this mean for CanTest? The cancer recommendations are shown in the box below. Several are particularly pertinent to our UK researchers (and should be of interest to our international colleagues). We pick out the three most relevant to us and give our viewpoint. This is an interesting one and suggests the Accelerate, Coordinate, Evaluate (ACE) Programme / Multidisciplinary Diagnostic Centre (MDC) models have been found to be successful. Although the ACE model has widespread support (especially from charities like CRUK), their evaluations are not complete and none was large enough to give definitive evidence to say that cancer outcomes – especially survival – are improved. There is considerable Danish evaluation of their new pathways (published in BMC Cancer and Cancer Epidemiology). Again, improved survival has not been demonstrated, though again, the sample sizes were too small to have shown this. There are several models of Rapid Diagnostic Centre (RDC), stretching from the ‘single symptom, multiple possible cancers’ clinics – a feature of the ACE models previously – to the fully-kitted out building with all the diagnostic equipment required to cope with a high-volume of site-specific referrals. CanTest’s research is particularly pertinent here. The investigations of choice in a RDC need careful research, evaluation and implementation. We also need to ensure our primary care focus on test research is broad enough that the RDC population can benefit from the results. That’s likely to be the case for most CanTest research, of course. This recommendation mirrors that of the Independent Cancer Taskforce in 2015 (PDF). The interesting point here is ‘when does the clock start?’ A lot of our pre-CanTest work was to characterise symptom profiles which may represent cancer. If the clock starts then, this would change things dramatically for primary care. In 2012, we wrote in the Aarhus statement that, for research purposes, the diagnostic clock begins when it was possible that cancer could have been diagnosed, not when it was probable, or when it was expected. It is more likely that this 28 day clock will start with a 2-week wait type urgent referral, so the pressure is on timely definitive investigation rather than on GPs to refer more ‘possible’ patients. 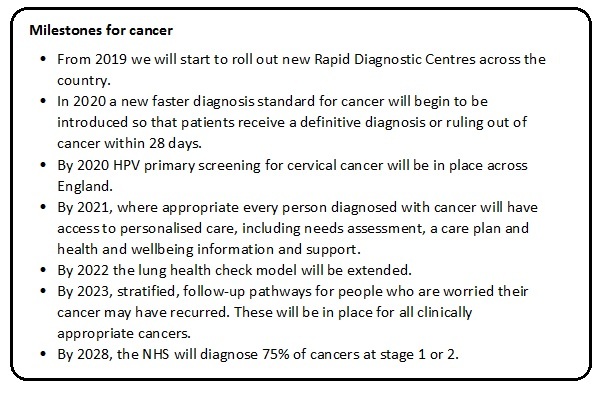 Even so, this makes CanTest research all the more relevant – if the investigation can be done in primary care (or a RDC) it will be easier to meet this target. We all want this, of course, but it will be a tough target and is probably aspirational rather than achievable. If it is achieved, it will partly be on the back of CanTest work!